Ram Alley, a mere seven feet wide, ran southwards from Fleet Street, opposite Fetter Lane. Its end point was a footway between two legal institutions: the Inner Temple and Serjeants Inn. Edward H. Sugden also mentions that the street was well known as the rear exit from another inn, the Mitre, which fronted onto Fleet Street. The alley was named after an inn, marked by the sign of the Star and Ram, which had originally belonged to the Knights Hospitallers but was confiscated by Henry VIII. It was taken in fee from the monarch for £54 by Robert Harrys, or Harris, and became the site of his brewery, which had a frontage on Fleet Street (Bell 247). The alley is now known as Hare Place, named after Hare House (Paige letter #154). An unlabelled alley in the correct location as Ram Alley appears on the Agas map. The alley is marked on both the Ogilby and Morgan map of 1676 and the Rocque map of 1746. The Ogilby and Morgan map (1676), showing Ram Alley (labelled k40). Image courtesy of British History Online (BHO). The Rocque map (1676), showing Ram Alley. Image courtesy of Locating London’s Past. Ram Alley was a place of sanctuary for criminals. Those seeking to evade capture would run into Ram Alley, which, like the Whitefriars nearby, still claimed right of sanctuary: that is, the immunity from arrest. 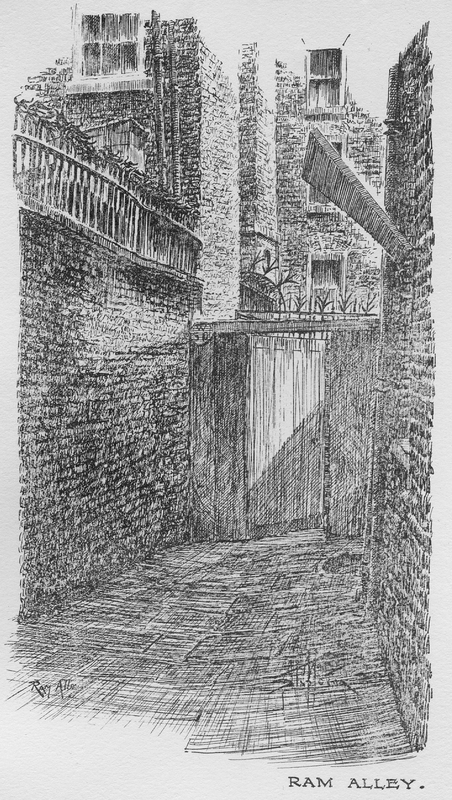 A 1603 source cited by William Kent comments that there is a door leading out of Ram Alley to the tenement called the Miter in Fleet-streete, by which means thereof such persons as do frequent the house upon search made after them are conveyed out that way (Kent 494). The freedom was requested under common law by several of the London liberties, many of which were formerly monastic land.1 In an area known from the seventeenth century as Alsatia,2 Ram Alley was particularly renowned as a place of refuge for those in debt, and was the resort of sharpers and necessitous persons of very ill fame, and of both sexes (Nares 719). Even in 1640, a debtor taking refuge in Ram Alley was considered by his creditor beyond pursuit (Calendar of State Papers Domestic: Charles I, 1639-40 February 20). Sugden notes, [i]t was a place of evil reputation, inhabited chiefly by cooks, bawds, tobacco-sellers, and ale-house keepers and adds that [t]he worst of its dens was the Maidenhead, near the Temple end of it (Sugden 426). Walter George Bell calls it Ram Alley of evil association, perhaps the most pestilent court in London (Bell 252). Perhaps this unsavoury reputation is why it is not mentioned by John Stow in A Survey of London. Parish records show a fear that the alley should become a refuge of the poor, with residents taking in unwelcome lodgers—particularly foreigners—into their midst. One such incident is noted in the wardmote inquests of St. Dunstan from 1598: Item, we present Margaret Lylly, who came to dwell in Ram Alley within three months last past and lodgeth one Symon Dominico, a frenchman borne and his wife in her house, who [...] are like to be a charge to the p’ishe and the cittie (St. Dunstan’s parish reigsters, 1598 qtd. in Bell 244). Title page of Lording Barry’s Ram Alley (1607-8). Image courtesy of Wikimedia Commons. Will you be gon directly, are you mad? Ale-men, and Landreſſes, why are you fooles? Elizabeth Hanson comments on the play’s geographical and social specificity (Hanson 233), but, in his essay on the relationship between the audience and actors in the play, Jeremy Lopez nuances this point, arguing that the play seems to be about being in Ram Alley, but it’s really about its spectators knowing that they’re not (Lopez 202). He suggests that the play portrays the area and uses its stereotypical attributes to appeal to those playgoers who lived in the city but outside the area of the Whitefriars itself. The alley is referred to by several other contemporary writers, who also focus on its key associations. The alley’s reputation as a place to flee the forces of the law is again shown in Richard Brome’s A Mad Couple Well-Match’d, where the spendthrift nephew, Careless, takes sanctuary from his uncle and other creditors in Ram Alley. Having got hold of money, he announces, I need no more inſconſing now in Ram-alley, nor the Sanctuary of White-fryers, the Forts of Fullers-rents, and Milford-lane, whoſe walls are dayly batter’d wth the curſes of bawling creditors (Brome, A Mad Couple Well-Match’d sig. C8r), giving a list of places where men could evade pursuit. In The Damoiselle, Brome continues the association of Ram Alley with sanctuary, as Bumpsey, looking for his son-in-law, enters the alley to seek information: Ille but ſtep up / Into Ram-Alley-Sanctuary, to Debtor, / That praies and watches there for a Protection (Brome, The Damoiselle E4r). The Rabelaisian account of the area in The Floating Island (1673) by writer and bookseller Richard Head also focuses on the alley’s reputation as a refuge from pursuit. The supposed writer of the work explains its origins in a period of forced inertia in Ramallia, or Villa Franca, a Sanctuary to all perſons whatſoever (Head sig. A2v). It was, he tells his reader in a prefatory epistle, an account of an imaginary journey pen’d laſt long Vacation, when all I had to do, was to hide my ſelf from the Inquiſition of my cruel Creditors; for which purpoſe I lodg’d in Ram-alley (Head sig. A2r). Lithograph of Ram Alley from Stapleton (1924). And ſtrowes about Ram-ally meditations. Cleanly to gird our looſer libertines? The association of the alley with food and drink is demonstrated by Ben Jonson’s Lickfinger, the thieving cook in The Staple of News, who is labelled mine old hoſt of Ram-Alley (Jonson 2D2v). In Philip Massinger’s A New Way to Pay Old Debts, this connection with food is again linked to the quotidian practices of nearby lawyers when Amble says of Marrall, the attorney: [t]he knaue thinkes ſtill hee’s at the cookes ſhop in Ramme-alley, / Where the Clarkes diuide and the Elder is to chooſe (Massinger sig. E2v). Thomas Nashe, in his Prognostication, shows that the association with food could be combined with the alley’s reputation for roguery: but let the fiſh-wiues take heede, for if moſt of them proue not ſcoldes [...] they ſhall weare out more ſhooes in Lent then in anie two months beſide through the whole yeere, and get their liuing by walking and crying, becauſe they ſlaundered Ram alley with ſuch a tragical infamie (Nash sig. B4v). Sugden suggests the fishwives may have harangued the cooks of Ram Alley because they illicitly sold flesh on Fridays or in Lent. The provision of food is connected with the area’s predatory sexuality, which had been referred to so casually in Barry’s play, in a salacious pamphlet of 1681 called Whipping Tom. In the account made of Tom’s sexual attacks upon London women, there features one on the Woman that cries hot Gray Peaſe about the Streets, coming up Ram Alley in Fleete-ſtreet (Whipping Tom sig. A1v). Having laid on her his cold hand, she loſt all power of Reſiſtance, and along with it her peas, which she had afterwards to ſcrape up her Ware as well as ſhe could, for the uſe of ſuch longing Ladies as are affected with ſuch Diet (Whipping Tom sig. A1v). As well as food and drink, the area was also known for another popular vice in the early modern capital, the smoking of tobacco—the supplying or indulgence of which habit was often found unacceptable by the members of the legal profession whose property abutted the alley. The St. Dunstan’s wardmote register of 1630 records one such offence: Item, we present Timothy Howe (of Ram Alley, Fleet Street) and Humfry Fenne for annoying the Judges at Serjeants Inn with the stench and smell of their tobacco (St. Dunstan’s parish reigsters, 1630 qtd. in Bell 274). Bell continues to quote the wardmote from 1618 which combined complaints about drink with those against tobacco. The register laid complaint against Timothy Louse and John Barker, of Ram Alley, for keeping their tobacco shoppes open all night and fyers in the same without any chimney and suffering hot waters [spirits] and selling also without licence, to the great disquietness and annoyance of that neighbourhood (St. Dunstan’s parish reigsters, 1618 qtd. in Bell 274). Finally, in The Blind Beggar of Bethnal Green, John Day and his collaborator, Henry Chettle, make use of the alley’s fame as a place of popular recreation. Disguised as a Maſter of the Motion or puppet-master, Canby promises his customers, Tom Strowd and Swash, you ſhall likewiſe ſee the amorous conceits and Love ſongs betwixt Captain Pod of Py-corner, and Mrs. Rump of Ram-alley (Day sig. G1v-G2r). Sugden notes that Captain Pod was a well-known exhibitor of puppet shows, and that it may be presumed Mrs. Rump was equally historical. The modern day Hare Place remains an alleyway cutting through to the Inner Temple from Fleet Street, and appropriately emerging next to a wine merchant. Barry, Lording. 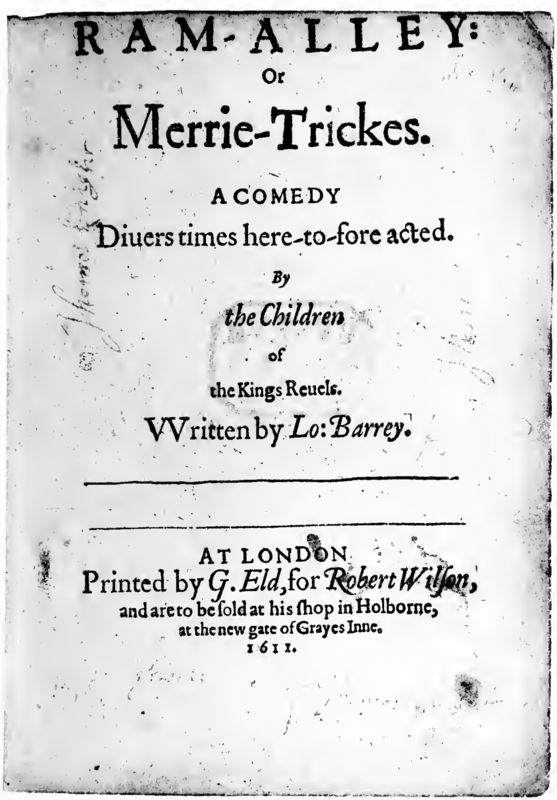 Ram-Alley: Or Merrie-Trickes. London: Printed by G. Eld. for Robert Wilson, 1611. Reprint. Early English Books Online. Web. Bell, Walter George. Fleet Street in Seven Centuries: Being a History of the Growth of London Beyond the Walls into the Western Liberty, and of Fleet Street to Our Time. London: Sir Isaac Pitman and Sons, 1912. Internet Archive. Open. Bly, Mary. Playing the Tourist in Early Modern London: Selling the Liberties Onstage. PMLA 122.1 (2007): 61–71. Brome, Richard. The Demoiselle, or the New Ordinary. London: T[homas] R[oycroft] for Richard Marriot, and Thomas Dring, 1653. Reprint. Richard Brome Online. Ed. Richard Cave. Royal Holloway, University of London and Humanities Research Institute, University of Sheffield. Web. Open. Brome, Richard. A Mad Couple Well-Match’d. Five New Playes. London: Humphrey Moseley, Richard Marriot, and Thomas Dring, 1653. Sig. A5v-H2r. Reprint. Richard Brome Online. Ed. Richard Cave. Royal Holloway, University of London and Humanities Research Institute, University of Sheffield. Web. Open. Calendar of State Papers Domestic: Charles I, 1639-40. Ed. Wiliam Douglas Hamilton. London: Her Majesty’s Stationery Office, 1877. Day, John [and Henry Chettle]. The Blind-beggar of Bednal Green. London: R. Pollard and Tho. Dring, 1659. Reprint. Early English Books Online. Web. Hanson, Elizabeth. There’s Meat and Money Too : Rich Widows and Allegories of Wealth in Jacobean City Comedy. English Literary History 72.1 (2005): 209-238. Head, Richard. The Floating Island, or a New Discovery. London: Published by Franck Careless [i.e., Richard Head], 1673. Reprint. Early English Books Online. Web. Jonson, Ben. The Staple of Newes. The Works. Vol. 2. London: Printed by I.B. for Robert Allot, 1631. Sig. 2A1r-2J2v. Reprint. Early English Books Online. Web. Lopez, Jeremy. Success the Whiitefriars Way: Ram Alley and the Negative Force of Acting. Renaissance Drama 38 (2010): 199-224. Massinger, Philip. A New Way to Pay Old Debts. London: Printed by E[lizabeth] P[urslowe] for Henry Seyle, 1633. Reprint. Early English Books Online. Web. Nares, Robert. A Glossary; Or, Collection of Words, Phrases, Names, and Allusions to Customs, Proverbs, etc., which have been Thought to Require Illustration in the Words of English Authors, Particularly Shakespeare and His Contemporaries. New ed. Ed. James O. Halliwell and Thomas Wright. Vol. 2. London: John Russell Smith, 1867. Nashe, Thomas. A Wonderfull Strange and Miraculous Astrologicall Prognostication for this Yeere 1591. London: Thomas Scarlet, 1591. Reprint. Early English Books Online. Web. Ogilby, John and William Morgan. A Large and Accurate Map of the City of London Ichnographically Describing All the Streets, Lanes, Alleys, Courts, Yards, Churches, Halls and Houses, &c. Actually Surveyed and Delineated by John Ogilby, esq., His Majesties Cosmographer. London, 1676. Reprint. The A to Z of Restoration London. Introduced by Ralph Hyde. Indexed by John Fisher and Roger Cline. London: London Topographical Society, 1992. Paige, John. The Letters of John Paige, London Merchant, 1648-58. Ed. G.F. Steckley. London Record Society 21. London: London Record Society, 1984. British History Online. London: London Record Society, 1984. Open. Shadwell, Thomas. The Squire of Alsatia. London: Printed for James Knapton, at the Queen’s Head in St. Paul’s Churchyard, 1688. Reprint. Early English Books Online. Web. Stapleton, Alan. London Alleys, Byways, and Courts. London: John Lane The Bodley Head Ltd., 1924. The Returne from Pernassus, or the Scourge of Simony. London: Printed by G. Eld. for Iohn Wright, 1606. Reprint. Early English Books Online. Web. Whipping Tom brought to Light, and Exposed to View: In an Account of Several Late Adventures of the Pretended Whipping Spirit. London: Printed for Edward Brooks, 1681. Reprint. Early English Books Online. Web. Watson, Jacqueline, and Joey Takeda. Ram Alley. The Map of Early Modern London, edited by Janelle Jenstad, U of Victoria, 20 Jun. 2018, mapoflondon.uvic.ca/RAMA1.htm. Watson, Jacqueline, and Joey Takeda. Ram Alley. The Map of Early Modern London. Ed. Janelle Jenstad. Victoria: University of Victoria. Accessed June 20, 2018. http://mapoflondon.uvic.ca/RAMA1.htm. Watson, J., & Takeda, J. 2018. Ram Alley. In J. Jenstad (Ed), The Map of Early Modern London. Victoria: University of Victoria. Retrieved from http://mapoflondon.uvic.ca/RAMA1.htm. Character in Ben Jonson’s The Staple of News. Character in Richard Brome’s The Damoiselle. Character in Richard Brome’s A Mad Couple Well-Match’d. Brewery owner who purchased the Star and Ram Inn from Henry VIII, which later became the site of Ram Alley. Resident of Ram Alley charged with harbouring foreigners. French foreigner who lodged in the residence of Margaret Lilly in Ram Alley. Character in Lording Barry’s Ram Alley. Nickname given to an unidentified sexual predator who frequented the alleys around Fleet Street in 1681. Resident of Ram Alley described in a 1630 wardmote register as annyoing the judges of Serjeants Inn with the stench of his tobacco. Possible resident of Ram Alley described in a 1630 wardmote register as annyoing the judges of Serjeants Inn with the stench of his tobacco. Shopkeeper in Ram Alley charged with selling tabacco and alcohol throughout night without a lisence. Not to be confused with John Barker, the ballad writer. Shopkeeper in Ram Alley charged with selling tabacco and alcohol throughout night without a lisence. Character in John Day and Henry Chettle’s The Blind Beggar of Bethnal Green. Well-known exhibitor of puppet shows in early modern London. Alluded to in John Day and Henry Chettle’s The Blind Beggar of Bethnal Green. Resident of Ram Alley. Alluded to in John Day and Henry Chettle’s The Blind Beggar of Bethnal Green.